Israeli soldiers invaded on Saturday evening, Beit Ummar town, near the southern West Bank city of Hebron, and kidnapped one Palestinian during clashes with local youths, while many suffered the effects of tear gas inhalation.Mohammad Awad, spokesperson of the Popular Committee against the Wall and Settlements in Beit Ummar, said the soldiers kidnapped Mahmoud Mohammad Abu Mariya, 20, while he was walking out of a local shop, in the ath-Thaher area. 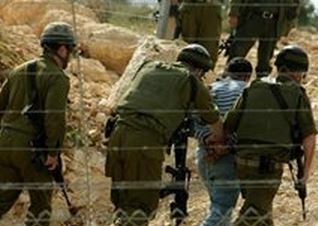 The soldiers cuffed the kidnapped Palestinians and took him to the nearby Karmie Tzur illegal settlement, built on Palestinian lands south of Beit Ummar. Awad added that several Palestinians suffered the effects of tear gas inhalation; two soldiers were injured after being hit by stone thrown by Palestinian protesters.